The only thing that is constant in life is change, and when it comes to a career, this is especially true. As part of the POPSUGAR Insights 2016 Career Report, we surveyed over 2,000 women between the ages of 18 and 49 and explored how long they plan to stay with their current employer. Overall, 39% of women plan to stay with their current employer for over 10 years, and 30% plan to stay with their current employer for less than two years. When viewed across demographic segments, women between the ages of 30 and 44 are 138% more likely to plan to stay with their current employer for more than 10 years while women under the age of 30 are 111% more likely to plan to stay less than one year. In total, just 19% of women under 30 plan to stay with their current employer for less than one year. The gap between retention speaks to a host of perhaps very different situations, but one important question is this: What can companies do to help women consider staying at their current job for more than just one year? The answer potentially lies in the reasons why women would consider taking another position. 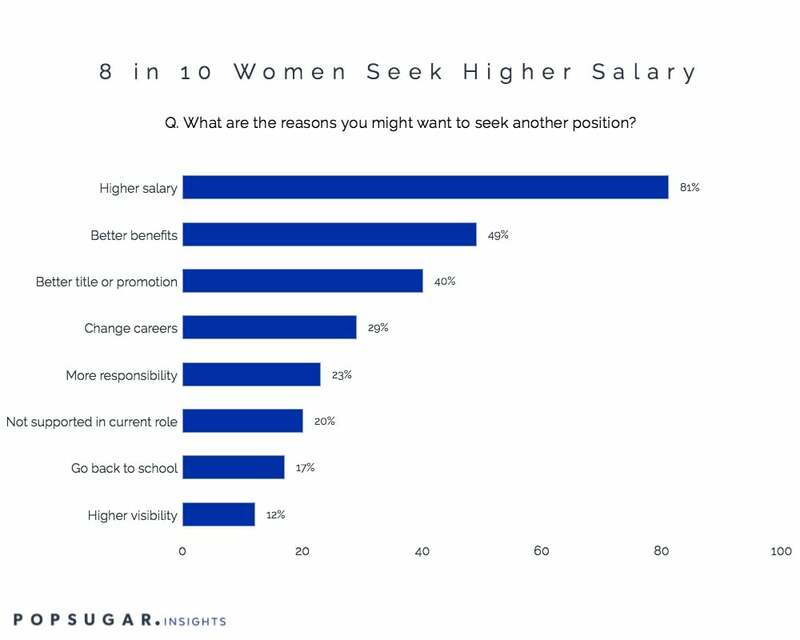 We learned that overall, women consider leaving their current job for a new position because they are offered a higher salary (80%), better benefits (48%), or a better title or promotion (38%). Additional reasons for considering a new position include a change of careers (29%), a desire for more responsibility (22%), they do not feel supported in their current position (19%), or they wish for more visibility in their company (12%). Women under the age of 30 are 33% more likely to consider a new position if it offered higher visibility, 32% more likely to consider a new job if it offered more responsibility, and 18% more likely to switch if the new role came with a better title. Moving because of a higher salary is a primary motivation for women of all ages. In order to offer advice to women who would prefer to stay longer in their current position but lack some of the benefits that cause them to seek employment elsewhere, brands can offer smart and relevant advice on how to increase their visibility at work, how to negotiate for a better title, benefits, or salary, and how to take on more responsibility while obtaining more support in their current role. By providing valuable workplace advice, brands from any vertical category can find a way to become a woman's career champion and support their career growth.